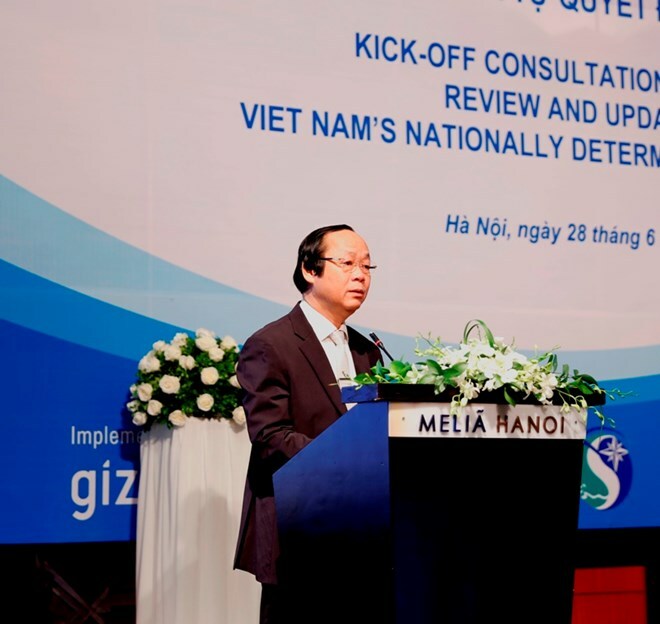 A workshop was held in Hanoi on June 28 to kick off the review and update of Vietnam’s nationally determined contributions (NDCs) which are meant to realise the Paris Agreement on climate change. The event was held by the Ministry of Natural Resources and Environment (MoNRE), the UN Development Programme (UNDP), and Germany’s Federal Ministry for the Environment, Nature Conservation, Building and Nuclear Safety. It was attended by members of the steering board for the implementation of the UN Framework Convention on Climate Change, the Kyoto Protocol and the Paris Agreement; members of the advisory council of the National Committee on climate change; representatives of ministries, sectors, development partners, embassies, businesses, non-governmental organisations; along with domestic and foreign scientists. The workshop aimed to collect opinions on the content, the roadmap and the role of relevant sides in the review and update of NDCs from now to 2020. MoNRE Deputy Minister Vo Tuan Nhan said NDCs need the participation and thorough consideration of all key concerned parties to ensure the transparency in the NDC implementation. He said Vietnam should review and update NDCs in a way that can reflect new requirements in the country and the world. The ultimate goal is to ensure Vietnam’s NDCs are feasible and reflect the country’s utmost efforts. To ensure the updated NDCs’ trustworthiness and feasibility, it is necessary to collect documents, information, research findings and climate change response efforts in all fields and from groups affected by climate change, he noted. Nhan asked development partners, international organisations, non-governmental organisations, ministries and sectors to provide necessary information or conduct supplementary studies to assist the NDC review and update. The Paris Agreement, adopted in December 2015, is the first legal document that binds each country’s responsibility and commitments, through NDCs, to coping with global climate change. Accordingly, each country is expected to submit updated NDCs every five years so as to help keep a global temperature rise well below 2 degrees Celsius by the end of this century, and make efforts to limit the temperature increase to 1.5 degrees Celsius and achieve net zero emissions in the latter half of the century.